Art as Usual: Some Ideas on Ways to Play and Help Others Too! Some Ideas on Ways to Play and Help Others Too! One of the absolute best things about the product development roll I took on last spring with Art 2 Heart is the ability to match people with hearts to projects that help. That involves knowledge of both the skills required or possessed, and the interest of the crafter. It's sheer torture to tell someone who works with knits to make bracelets if they don't want to. So, if you've considered using your mad craft skills to help others, a first word of advice, stick to your interest group. Only participate if it's something you'd genuinely enjoy doing. Next, do you want to work alone or in a group? If you can't find a group- would you consider making one? It's super fun to create with others. You can approach the group in two ways as well. You can see it as a bunch of gals pounding out the projects, or you can see the group itself as a mission. Are you willing to bring in newbies and teach them the how-to's? Would you like to involve local immigrants or the handicapped? Also, consider that just because you're an at home sort of person, groups can and do form online every day around a specific interest. Spend a little time searching and I'm sure you'll find something of interest! I've also included a few at the end of this post to get you started. The cutest! 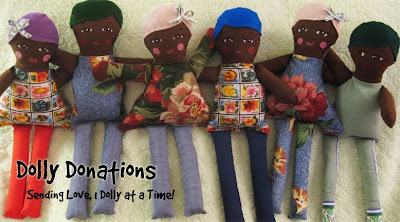 A doll pattern from Oh So Dollin- LOVE!!! Third consideration, how much are you willing to donate? Is is just time that you have, or do you have a stash of fabric that you'd love to use up? Are you willing to finance your work with the goal of donating it? I thought that to support a group I needed to make all my contributions donations. A friend suggested to me that I do consignment to cover the cost of materials and donate what's profit. Additionally, you can work with a gift shop that donates it's proceeds to missions and consign with them. They get a percentage of the sale plus you can gift them with whatever is above what you need to cover your costs. More ideas then crafting time?Consider donating ideas. There are really great groups of sewers, jewelry makers, diy crafters and pinterest devotees who are just dying for a way to play and help too. But they need ideas. They need to know what they can make that will really make a difference. Maybe that's baby blankets for a local crisis nursery, or knitted newborn hats for a local preemie ward, or maybe it's something else. I ran across a blog asking people to knit sweaters for penguins once. They'd been saved from an oil spill but weren't able to keep themselves warm. They needed sweaters. SO SO cute! Or the crafter might be creating goods for sale with proceeds going to a mission organization. Then they need someone with an eye to current trends who is able to pinpoint projects and help them get off the ground by maybe supplying step by steps and/or samples or someone willing to come and teach. We had a student at the shop who wanted to help but the paintings she donated weren't selling. I heard they were great but wall art just wasn't moving there. SO my group suggested she try the stamped jewelry and found her a class and aided with the set up and it's been a fabulous success! She is truly truly amazing and what she's done for others has just rocked our world. But today I wanted to start to share just a few more with direct links. Maybe you'll decide to help out one of these missions, maybe it'll give you ideas for starting your own. God can and will use every skill you have if you allow Him too. Trust me! First up today- as I was looking for a cute baby doll pattern I stumbled across the blog, Dolly Donations. They provide the pattern and you donate the dolls. Then they distribute them in places like Rwanda, Uganda, and Haiti. Dolls are both companions and security for little girls, I think this is a great ministry. Maybe you want to take this idea and provide Korean looking dolls for your local adoption agency. I bet that new parents would love to gift their child with a special doll as they prepare to bring them home. Once, when I called 911 and and rescue truck came they gave my son the cutest little bear to help him be brave. It was something I appreciated with my whole heart. Here are a couple more cute patterns that you can purchase and adapt to whatever you have in your heart to do. There are lots more groups like this and I have a feeling there'll be lots more to show you so check back in the next few weeks for more! Thanks for Reading and have a great day!! !